The brief video clip below also shows a fledgling fluttering it's wings to beg the adult to feed it then being fed. 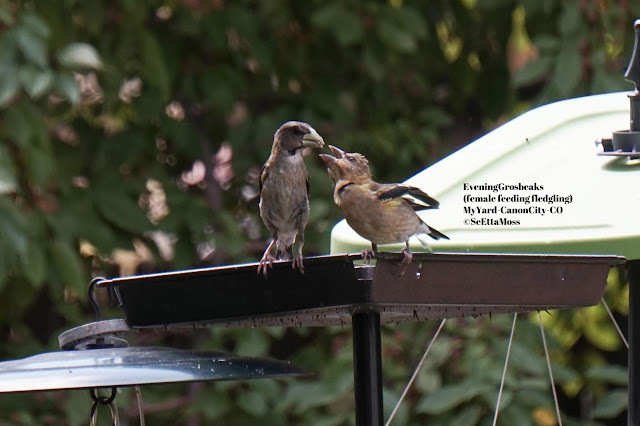 Evening Grosbeaks--feeding fledgling from SeEtta Moss on Vimeo. Last week I started hearing Evening Grosbeak calls so I put out the tray feeders with black oil sunflower seeds (they are so big they do best with tray feeders). I expect that these are some of the Evening Grosbeaks that spent spring in my neighborhood then left in May to go to their breeding locales at higher elevation. I am pleased that only about 1 dozen of the 3 dozen or so birds did returned as the larger flock was an awful lot of birds to host.